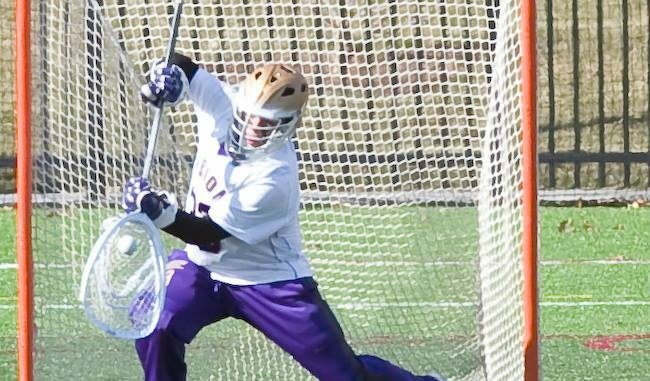 In 2010, Albion College announced it would name lacrosse a varsity sport. After winning just five games in their first two seasons combined, the program began to take off. The Brits finished second in the MIAA in 2013 and 2014, and they’ve won an MIAA championship in each of the last two seasons. A winning program attracts top tier talent, and with first-year goalie Trevor McManus, the Brits may have a leader in the crease. A native of Canton, Michigan, McManus was a four-year all-state goalie at Plymouth High School and was heavily recruited. He said he was being looked at by the University of Detroit-Mercy, Boston University and Binghamton University; however, what separated Albion from all other schools was the ability to be a student-athlete. McManus was also a goalie in hockey, where he led his Team Total club to the national tournament twice. The difference between being a goalie in hockey and lacrosse is quite different, and as he recalls, he wasn’t used to being scored on as much. The pain McManus has endured thus far seems to be worth it for the Brits. In nine games this season, McManus has a stellar .567 save percentage, which puts him 63rd nationally in Division III. In back-to-back games against Otterbein University and John Carroll University, McManus had .700-plus save percentages, which earned him defensive player of the week honors from the MIAA. As a first-year student-athlete, McManus has a lot of time to grow both on and off the field. Although DeCola sees him continuing to develop over the next four years, he believes his influence on the team was felt from the start. Photo courtesy of Albion Athletics.